Do you ever sit back and think about the trips you have had and what fun they were? There are some which are absolutely fantastic – can you recall all the details, the places you saw, the food you ate, the people you met? Maybe not. But there are always some experiences that stick – for reasons unknown. I get to the ranch and am all pumped up – training done, forms signed and I am all set to be strapped in. There are about 6 divers in my plane, who have completed anywhere between 20 jumps to over 200 each and intimidation kicks in. As we ascend, I try to smile and look relaxed, but my heard is jumping out of my chest. We are now over 13500 feet and the door of the plane opens and people start jumping out.I try and remember the instructions, the signals, the steps and it’s my turn next, and I almost want to ask my instructor for a “revision”, but I am at the door now, it’s too windy, too noisy and I can’t even hear myself. All I see is wide open skies, the earth below all blurry and my fellow divers looking like tiny black dots….my instructor yells “here we go…3…2…1”… and we jump! And oh boy, jump we did! 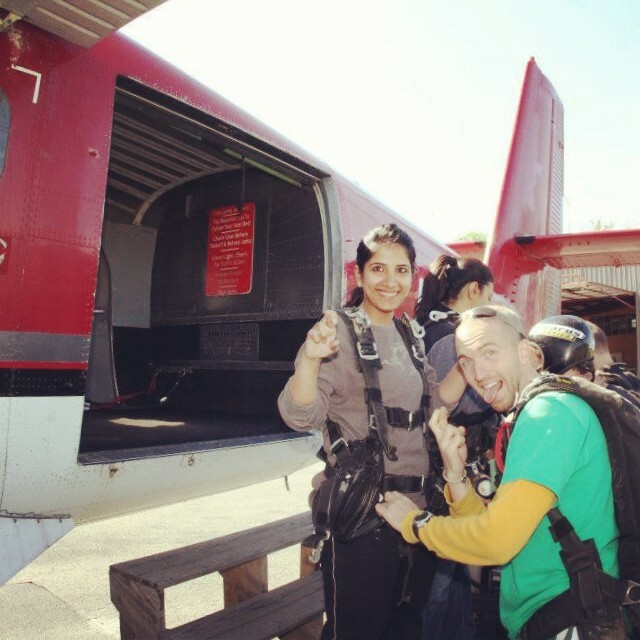 The moment before the jump, hell scary! 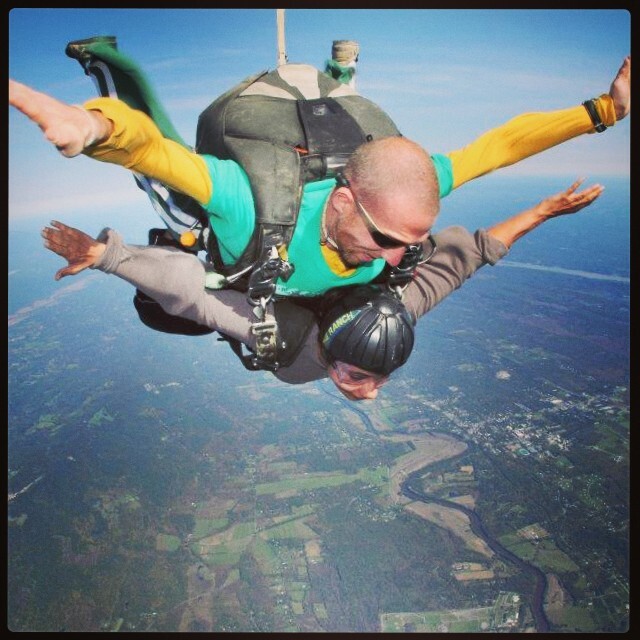 The excitement, the adrenaline, the rush, the feeling of a free fall, the air pressure on your body in overwhelming. I feel free, joyous, happy… So much so, that once the parachute is deployed, I am almost disappointed as I realize it is time to descend. 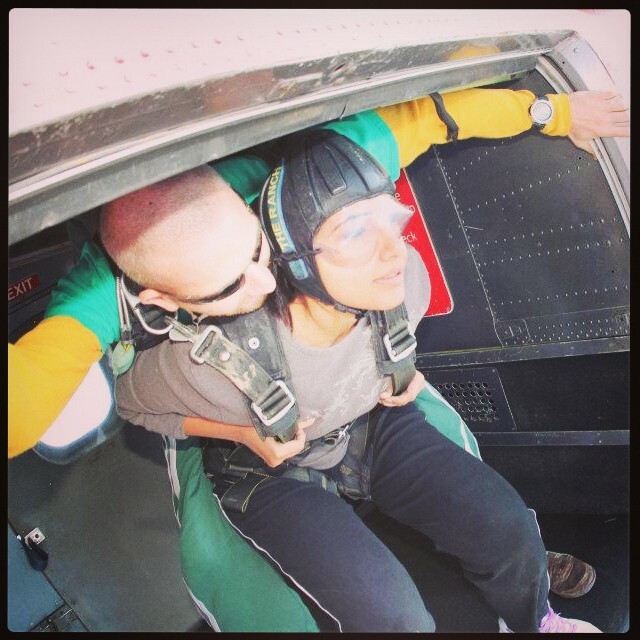 Watch the video below to see what I am talking about – believe me, the only scary bit about sky diving is the moment just before the jump… the rest is an amazingly blissful experience! One day I will ….. Ankita … I will jump ….. 🙂 …. keep writing …. Nice piece… keep them coming..